I absolutely adored The Body Finder by Kimberly Derting and was thrilled to recieve a copy of this for review from Headline. It's equal parts romance and murder mystery - what a great combination. I think Kimberly Derting did an excellent job with the balance. As soon as I started reading this one I just couldn't put the book down. Violet is no ordinary 16 year old. Since she was very young, she's had this 'special' ability to find dead bodies. Only her close family members and her best friend, Jay, are aware of her secret. It's fairly common for Violet to hear the special signals that mean that a body is near and she'll hunt it down, usually dead animals in the woods behind her house, and give it a proper burial. Her skill also includes sensing whether or not someone has killed that lingers. This ability becomes useful and also deadly dangerous when a serial killer starts snatching girls in her city and Violet begins sensing their dead bodies. Can Violet catch the killer without becoming victim as well? There are so many great things to like about this book. The first, is the relationship between Violet and her long-time best friend Jay. Violet has only recently started developing a major crush on Jay, but over the summer he's turned into a total hottie and starts recieving attention from all the most popular and beautiful girls at school. Violet doesn't really want to jeopardise or make her friendship with Jay awkward by admitting her feelings, so instead she stands by while other girls drool all over him. I think it's fairly obvious and not spoilerish at all to the reader that Jay does in fact reciprocate Violet's feelings, but the misunderstandings and the jealousy that springs up for both of them are bittersweet and tugged at my heartstrings. I wish, just a little bit, that the tension between the two went on just a little bit longer but I can understand that can be hard to maintain, especially as there is the other major plot issue of the serial killer. I really loved the fact that Kimberly Derting intersperses Violet's narrative with that of the thoughts and feelings of the serial killer. I thought it really added to the suspense knowing the information that we glean from inside the killer's mind. Excellent. I think Violet's forays into detective work were interesting, if a little risky. I was on board with it though. Violet does seem to make decisions and choices that are believable. Only a minor irritant, but I wasn't as convinced that the fight between Jay and Violet after some particularly hazardous sleuthing. Jay's response seemed a little extreme and not what I'd have been expecting from him, but I can see how the story needed a rift between Jay and Violet at that time. The other thing I enjoyed, is how involved Violet's family is to the story. No absent parents here, in fact, there's also an added protective uncle. It is nice to see a main character have some support in her life. All in all, a wonderful read. 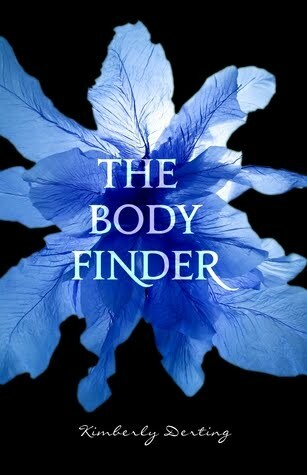 Dead bodies, a hunt for a serial killer and first love. What more could you want? Okay, this one is also going on my to-read list...and I love the cover! I can't wait to read this. Good review. The Slowest Bookworm - Thank you very much for following me, very kind of you :) And this one is really good, hope you find a copy of it soon! Tammy - AWW! Do you want my copy? I can send it to you?